So, as Talby touched on in his article, Windwalkers have very strong AOE capability, if given the opportunity to set some stuff up. However, we give up a lot of our single target damage in the process. Today, I’ll be exploring the current problem Windwalker faces when trying to fit into a raid environment and how its made us difficult to balance overall. The first thing that makes Windwalkers difficult to balance in both single target and AOE is the fact that many of our bigger single target abilities are also our bigger AOE abilities. Abilities like Fists of Fury, Whirling Dragon Punch, and (to a lesser extent) Strike of the Windlord all hit multiple targets. The former two, Fists of Fury and Whirling Dragon Punch, hit all targets for 100% damage whereas Strike of the Windlord has a modified “Meteor” damage where it does 100% damage to the primary target and 100/(N+1) to all other targets. Because these abilities serve double duty, any change made to single target, has an effect in AOE, and visa versa. So if Windwalkers are doing too much AOE damage through these abilities, Blizzard can nerf them, but will also nerf our single target damage at the same time. 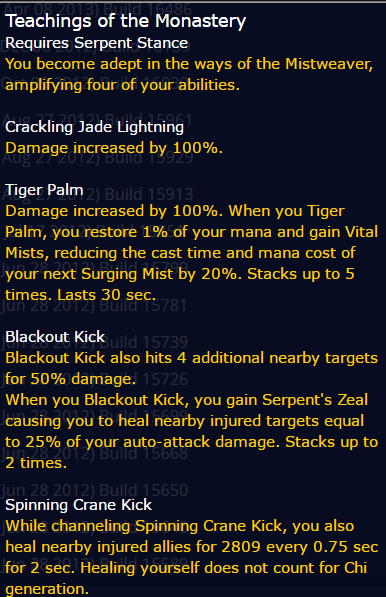 As we can see with the recent changes to the 7.2.5 PTR, Blizzard seems to be attempting to mitigate this problem by moving out single target damage away from Fists of Fury and into other abilities like Rising Sun Kick, Blackout Kick, and Tiger Palm, which would be my choice way of decreasing AOE damage while increasing single target damage, they just have to follow through with the second part of that. Our T20 tier bonuses are also primarily single target focused which will help us to single target damage without being too strong in AOE, which everyone will have their own opinion of *cough* fix us elsewhere *cough*. The second big problem with Windwalker AOE vs single target is Spinning Crane Kick and, more specifically: Cyclone Strikes. Because of how this scales with additional targets; gaining 100% damage per target hit, plus 50% damage per stack, which can very easily just be 150% per target. That scaling means that very quickly, we drop single target abilities like Rising Sun Kick and Blackout Kick from the rotation at a certain amount of targets and stacks, which means that when we’re doing AOE damage, our single target damage may suffer quite a lot. Using the chart from the SCK Article; https://i.imgur.com/inGv3Cv.png, (which is outdated and largely arbitrary since it depends on so much) you can see that at two targets and two stacks of Cyclone Strikes, you drop Blackout Kick from the rotation for overall damage. However, you need at least 6 stacks for that to be a benefit for any one target. For Spinning Crane Kick to beat out Rising Sun Kick in overall damage it only takes three targets and two stacks. But for single target it needs 9 stacks. This isn’t important when looking at overall damage and trying to pad or strictly do AOE damage but when looking at continuing to do maximal damage to the boss during AOE phases, there’s a pretty big disparity. To illustrate this, using the above points that you replace other abilities with Spinning Crane Kick. If you drop Blackout Kick in favor of Spinning Crane Kick at two stacks, its doing 100% increased damage from Cyclone Strikes. However, you need it to be doing 300% increased damage for this to be a benefit in single target. Which means that its doing half the damage you’d need it to do in single target (the math checks out, I checked). So in a boss fight with adds, you’re doing half the damage to the boss in order to get all that extra AOE damage. Thats a pretty considerable cost. Get rid of Cyclone Strikes and balance Windwalker AOE elsewhere. It requires more effort than any other spec’s AOE that I can think of, and is a scaling NIGHTMARE that we identified as soon as it was implemented in Alpha/Beta. I really don’t have a solution beyond identifying the problem. Long ago, in Mists, Mistweavers had a buff that caused their Blackout Kick to hit 4 additional targets; http://i.imgur.com/37HUhAI.png, so this could be a possible solution. Finally, a problem that faces Windwalkers in regards to choosing between AOE and single target is stats. Because of our resource intensive our AOE abilities like Spinning Crane Kick are, requiring 3 chi, it drastically boosts Haste’s weight compared to other stats. Haste can very easily equal Mastery in AOE situations and even outweigh it in some. However, in single target Haste is our least useful stat due to the large chunk of damage that is unaffected by haste, mainly Touch of Death, Touch of Karma, and Strike of the Windlord. This means that if you want to maximize your AOE damage, you want to stack Haste. However, due to its lack of effect on single target, you’d be giving up single target damage to do so. And on the flip side, conventional gear set ups for Windwalkers right now involves minimizing Haste on your gear, which puts you at a disadvantage for AOE situations. This is one that I’m actually pretty confident in. The easiest way to solve this problem, as well as help the other above issues is to allow Strike of the Windlord and Touch of Death to scale with Haste. This would bring Haste more in line with other stats, likely roughly even with Critical Strike as well as increasing single target damage with barely effecting AOE. I always thought the free blackout kick from combo breaker should do more damage to help with single target. Was wondering if switching from FoF relics to RSK is a smart idea for 7.2.5? My biggest concern is what happens when the tier 19 2 pc bonus goes away with these FoF changes. If FoF is relegated to not being an ability we don’t use normally in ST, I feel like we’re going to have a lot of chi with nothing really to spend it on without filling “filler” globals with CJL/FSK/CW and continuing to BoK. It’s the challenging part of the spec right now to figure out how many BoKs can be weaved in while still always keeping RSK and FoF on cooldown. Without FoF in the rotation I see everything becoming rather dull. Spot on. I mean, it seems like such a priority to balance other classes or just buff them to all hell and nerf them later. Babs, I noticed that a QnA is happening with Hazzikostas tomorrow and was hoping that one of you Peak folks would be in the channel to address our issues that seem to be ignored on the forums.